Hydraulic dredging of 147,000 CY of mercury-contaminated lake sediments from water depths ranging from 2.5–6 ft.
In-situ mechanical excavation of 7,800 CY of contaminated upland soils, spanning 17 areas of the site, with depths ranging from 0.5 – 8.5 ft. Implemented a turbidity containment system for hydraulic and mechanical excavation operations. 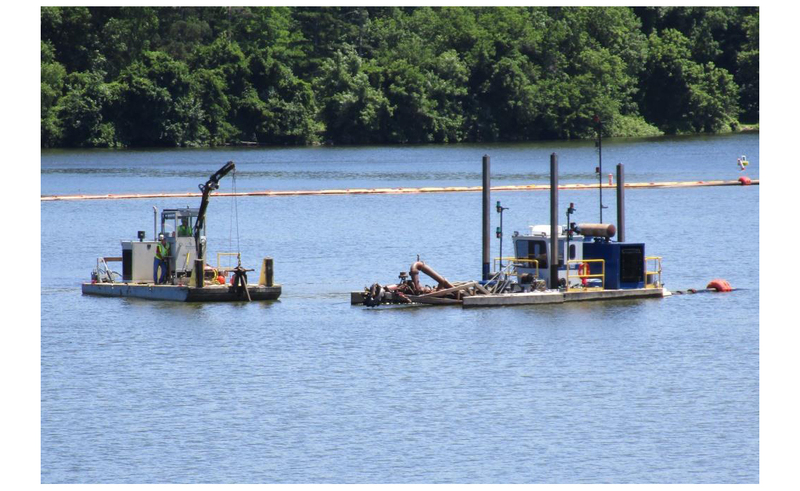 Debris removal prior to and during dredging operations. 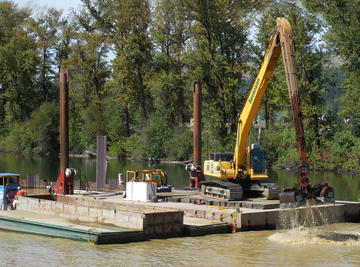 Dewatering and processing of approximately 70,000 tons of hydraulically dredged lake sediment. MAECTITE™ stabilization treatment of approximately 500 CY of lead-contaminated soil/sediment. Facilitated offloading and T&D operations of excavated/dredged sediment material for disposal at an approved landfill facility. Executed site rehabilitation operations, placed backfill material, and restored the site to preexisting lines and grades. The former Pompton Lakes Works (PLW) facility commenced operations in the early 1900s. Following the cessation of site activities in 1994, the PLW was gradually dismantled and closed. E.I. du Pont de Nemours and Company (DuPont) was subsequently mandated by the NJDEP to execute a remedial investigation (RI) at the site to determine the type and scope of contamination. Following the RI, the NJDEP modified the Administrative Consent Order (ACO) to identify The Chemours Company FS, LLC, as the primary responsible party. Previous remedial measures included soil excavation, post-excavation sampling, backfilling, and site restoration. Between 1991 and 1997, Acid Brook underwent remediation through streambed cleaning and excavation of adjacent floodplain soils. The footprint of Sevenson’s remedial dredging encompassed various areas of Pompton Lake, including the “Delta” or ABD (Delta Area); a portion outside of the Delta between the Lakeside Avenue Bridge and the Pompton Lake Dam (Lake Area A and Island Area); and the uplands portion, which encompassed the soil and wetland areas located between Lakeside Avenue and the water’s edge along the lake (or Uplands). The contaminants of concern included mercury in the sediment, as well as copper, lead, mercury, and zinc in the upland soil. Site mobilization was divided into three phases: 1) general mobilization for sheet pile installation; 2) site preparation operations; and 3) mobilization and assembly of solidification equipment. Site preparation activities included utility clearance; temporary facility construction; installing required traffic and safety signage; site layout surveying; installing security fencing; installing erosion and sediment controls; Acid Brook bypass pumping; working with property owners to remove docks and storage facilities; as well as constructing access roads and the material processing area. Site configuration operations included constructing an access ramp from the top of the bank down to the lower staging area, which facilitated the movement of equipment and field personnel. Sevenson also installed liner and asphalt pads for material containment and bin blocks; identified the best conveyor system routes; and installed the Total Clean System (oversized screening and desanding equipment). This phase of work also required installing eight mix tanks (used for slurry storage/preparation prior to injection into recessed chamber presses); eight recessed chamber filter presses; slurry fast-feed process pumps; and a 2,000-GPM waste water treatment plant (WWTP). 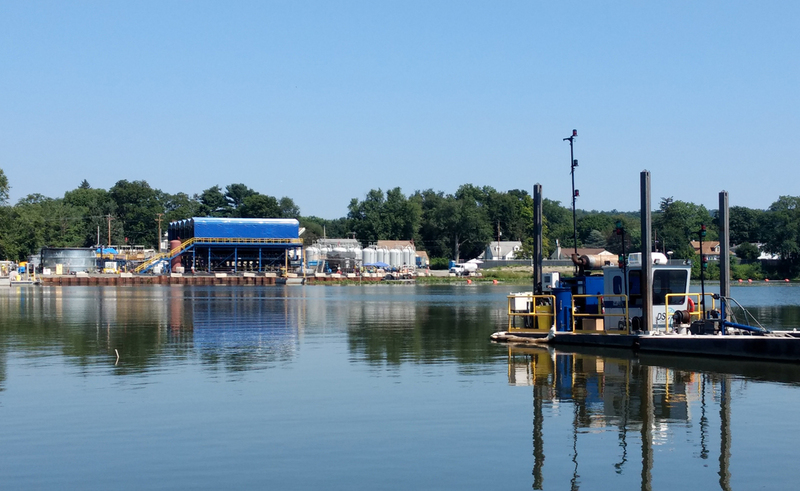 At the site’s boat ramp, the location from which excavation equipment was launched; Sevenson assembled and installed the 1,500-ft. HDPE hydraulic dredge pipeline. Before commencing soil/sediment removal operations, Sevenson managed water flow from Acid Brook, the storm sewer outfalls, and groundwater/surface water by developing and implementing a collection sump at the northernmost end of Uplands Area A within Acid Brook, as well as a small dam comprised of sandbags and stone to intercept flow. Ponded water was conveyed using 12-in. 2,000-GPM Godwin-type pumps into an HDPE line. The maintenance of these pumps also mitigated the potential for upstream flooding of Lakeside Avenue. Sevenson also installed turbidity containment systems. Loaded onto a barge, the curtains were transported by towboats to where they were assembled. The turbidity containment system for the Delta Area was a three-tiered approach comprised of several components: 1) oil/debris boom installed outside of the dredge area in the non-targeted sediment zone. The curtain was “top-down” (the top edge of the curtain was positioned above the water surface), and the oil boom was attached on the inside edge (closest to the dredge area), extending 1.5 ft. below the water surface; 2) bedload baffle installed outside of the oil/debris boom. The bedload baffle was installed as a “bottom-up”-type curtain such that the top of the bedload baffle was two ft. above the surface sediment; 3) installed a traditional permeable turbidity curtain outside of the bedload baffle. The curtain was top-down and installed such that the fabric reached down to within one ft. of the sediment surface. Following the installation of the turbidity containment system, Sevenson, in accordance with the Fish and Wildlife Scientific Collection Permit, worked with third-party biologists to capture and relocate all fish and marine turtles outside of the containment system before dredging operations. Sevenson executed a pre-dredge debris survey to identify submerged material that needed to be removed prior to dredging. Using a mechanical dredge, Sevenson removed debris and conveyed the material to an on-shore staging area. 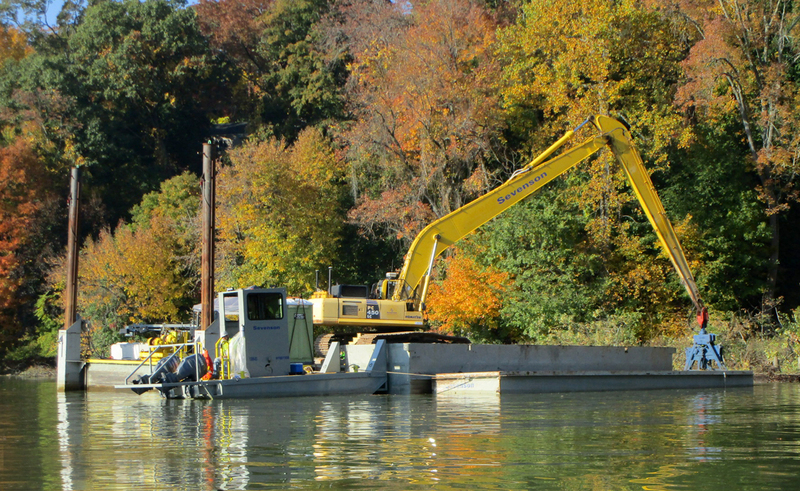 A barge-mounted excavator, equipped with a perforated bucket, was used to extract boulders, rocks, and other large material. Sevenson selected this type of bucket because it simultaneously facilitates sediment filtration and retains debris in the bucket. Removed debris was placed in a shallow-draft material scow, which, upon reaching capacity, was relocated to the access pier and bulkhead where it was unloaded using a backhoe placed on shore. After being unloaded, the debris was placed in transport trucks and removed to an off-site landfill facility. Sevenson mobilized a Komatsu PC300 long-stick excavator to remove soils and sediments. Concurrently, the excavator moved temporary piles and stockpiled the soils/sediments with the footprint of the excavation areas to facilitate gravity draining. A conveyor then transferred the drained material to the processing area located on the containment pad. In areas where deep excavation was required (exceeding six ft.) slopes were cut back at a safe angle of repose to allow excavators to safely access the area. All groundwater encountered within the work areas was removed using pumps. Sevenson also implemented a tank and bag filter to extract suspended solids from the groundwater before discharging it into the Delta Area. The upland soil and shallow water Delta Area sediment material was processed within containment bins on a lined and bermed asphalt pad. Upon finishing the mixing process, a grab sample of the processed material was obtained for a paint filter test. Batches that did not pass the paint filter test were further amended with reagent material at a mix ration of 5–10 percent by weight until passing results were obtained. All amended materials were then conveyed to the staging/loading pad for transport and dispatch to the landfill facility for disposal. Upon completing excavation operations, Sevenson installed a six-in. ecological layer over the top of the shallow water Delta Area. Approximately 900 CY of clean material were placed. Materials were trucked to the site and placed within the designated areas. Adhering to a 12-hr.-day, 5-day-week work schedule, Sevenson hydraulically dredged approximately 147,000 CY of sediment from within the open-water Delta Area using an eight-in. Moray dredge capable of removing 50–120 CY per hour and up to 17 ft. deep. Positioning the dredge was enabled by RTK-GPS system (Trimble 461 with heading), as well as a DREDGEPACK® system. To ensure consistent removal accuracies, the proposed contour surface was programed into the DREDGEPACK® system, providing the dredge operator a precise display of targeted removal depths and elevations. 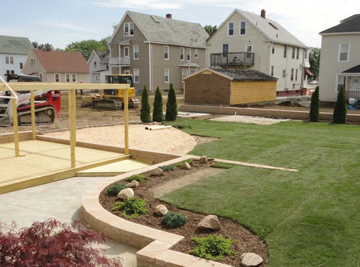 Without impacting the project schedule or budget, Sevenson managed site-specific challenges and differing site conditions. 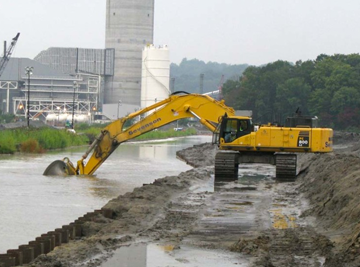 For example, Sevenson executed dredging activities within a work space within 100 ft. of residential properties. Vibration monitoring was conducted during sheet pile installation to ensure that operations did not undermine the structural integrity of nearby properties. 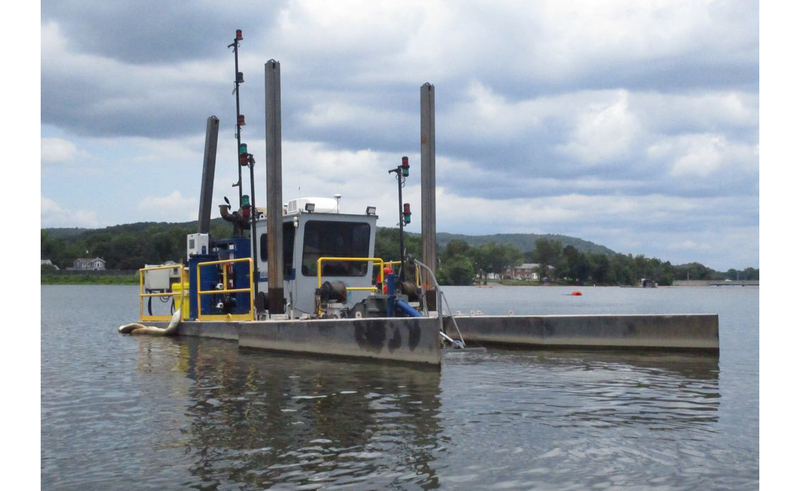 After encountering a large volume of oversize rock that could not be removed using a hydraulic dredge, Sevenson mobilized a mechanical dredge with a screening bucket to separate rock and other bulky debris from the targeted sediment. Following dredging operations, Sevenson placed the separated rock material back in the Delta Area, which saved disposal costs. Hydraulic dredging operations generated slurry at a rate of 1,500–2,500 GPM containing, on average, 7–15 percent of solids by weight. The dredged slurry was pumped through a vibrating shaker screen with 1- to 0.5-in. screens, which removed debris, stones, large wood chips, and gravel from the slurry material. Screenings were discharged onto the staging pad for transport to the stockpile area. The screened dredge slurry was then conveyed, via gravity, to a V-bottom tank where it was drawn from the bottom and moved through the desanding units. The underflow from the desanders was directed over dual-vibrating linear motion shakers with 200 mesh screens for additional sand removal. Overflow from the desanders was pumped to eight 20,000-gallon agitated mix tanks. Filter press fast-feed centrifugal pumps drew from the agitated mix tanks to fill the eight 219-CF filter presses. Filtrate from the filter presses was treated with polymer—through a flow meter, static mixer, and polymer injection system—to an inclined plate clarifier to further remove fine material, which was then processed through ten granular activated carbon units and bag filters before water was discharged to the lake. Sevenson remediated areas within the Uplands and Delta Area impacted by higher lead concentrations using an in-situ stabilization method involving a chemical injection system with a specialized mixing head attached to the hydraulic excavator. Sevenson’s proprietary MAECTITE™ treatment additive was used to stabilize the lead-impacted material. The footprint of the in-situ treatment encompassed approximately 500 CY spanning one soil and four sediment areas. The implementation of this treatment alternative ensured that the metals ultimately met TCLP standards. Site restoration activities for disturbed open-water areas included hydraulically placing an ecological layer of 42,400 CY of clean material within the Delta Area dredge zone. 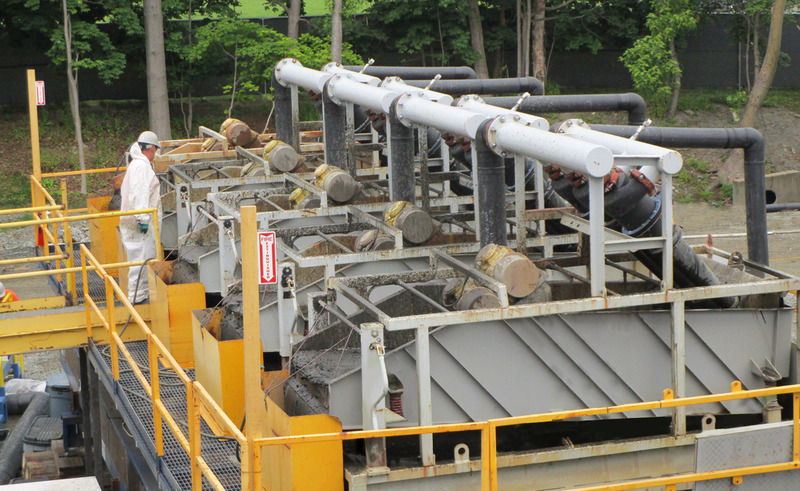 Sevenson mobilized a hydraulic spreader system, comprised of a feed hopper, oversized screening, and a slurry system, that hydraulically pumped the sands through a pipeline and placed on a barge through a diffuser system. Clean fill material was placed in two layers, two in. for the first pass and four in. for the second pass. Sevenson’s daily production rate averaged 1,000 CY/day. Additional site restoration operations included bolstering and revegetating the shoreline of the Delta Area and Island Area using coir logs; seeding; removing and replacing sidewalks/turf areas impacted by site activities; and tree/shrub plantings. All equipment was decontaminated on site prior to demobilization.